Hollywood action hero Jackie Chan gave the best surprise to his fans by dancing with Bollywood hunk Sonu Sood to a Punjabi track 'Tunak tunak tun' at the 19th Shanghai International Film Festival. This news has gone viral and fans are going gaga over it. Thrilled Sonu shared the video of their dance and captioned it saying, "Impromptu dance moves with my brother Jackie Chan. Shanghai Kung Fu Yoga". 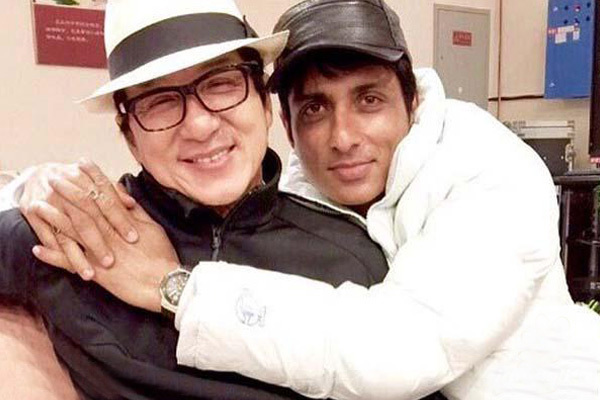 Sonu Sood and Jackie Chan will soon be sharing screen in a Sino-Indian project titled 'Kung Fu Yoga'. They both had recently attended the red carpet for the Film Festival and performed a spontaneous dance on the Daler Mehndi song on the stage. Which is truly worth to watch!